It's Madness...we know. There's a lot of talk about whether employers should let employees check their brackets while at work. We did some hunting and found these great tips for business owners and HR managers to rally around the issue. It looks like the winning answer is YES! Show their colors. Employees might rally around a casual day that allows them to wear the colors of their favorite team. Flex some muscle. Workers may appreciate flexible hours that allow them to catch a big game. Pool resources. A company-wide pool that allows employees to fill out the brackets for fun — and does not involve cash prizes or an entry fee — could be an ice-breaker, and chatter about last-second victories and upsets offers an opportunity for employee bonding. Take a break. An organization that does not allow employees to bring their cell phones, iPads, or other portable electronics into the office may let workers check scores online while on break. Also, make sure the games are on in the lunchroom so workers can do some scoreboard watching during lunch or break time. March Madness at Work: Can it Be a Slam Dunk? Morale vs. productivity Staffing company OfficeTeam recently surveyed more than 1,000 managers on the effects of the NCAA tournament in their workplaces. Twenty percent of the managers felt office activities related to the tournament improved employee morale at least somewhat. Just four percent viewed them negatively. The majority—75 percent—said March Madness events at work have no effect on morale or productivity. This year’s survey differs from OfficeTeam’s 2010 survey, in which 41 percent of executives felt office tournament celebrations helped morale while 22 percent thought those activities hurt productivity. Managers were asked, "Do you feel March Madness (NCAA basketball tournament) activities in the workplace, such as watching games or participating in pools that don't involve money, have a positive or negative impact on employee morale?" Managers also were asked, "Do you feel March Madness activities in the workplace have a positive or negative impact on employee productivity?" Morale: As people come out of the dark corners of their cubes and begin interacting with each other, it creates a happy environment to share creative ideas. And, we all know, happier employees work more productively. Inclusiveness: When employees feel as if they are included in something, they unknowingly create an equalizer that has the power to transcend title and position. So, everyone feels like they belong and have something fun to which they can look forward. Engagement: Employees are not only engaged with each other, but they’re more engaged with their work. The fact is: March Madness brings out the best in most of us. 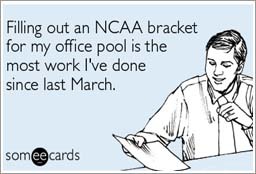 The most important thing to remember is that people will continue to play brackets ...and will do it at work. It is incumbent upon management and HR to find ways to keep employees engaged and to let them have some fun. But it’s also important to develop guidelines to avoid that possible HR catastrophe. For more information on HR consulting, employee benefits, employee welfare and well-being, or any risk management concerns, contact a knowledgebroker today.